Organizations of all sizes are realizing the value of technology to support the integration of talent processes and achieve efficiencies and effectiveness. Wherever you are in this integration strategy, change management forms the foundation to success. That takes a significant commitment of time and leadership buy-in from the top of the organization to front line leaders and across functions. Bersin’s Integrated talent management (TM) model demonstrates that central to successful integration of various talent processes is the goal to drive engagement and ultimately increase retention. 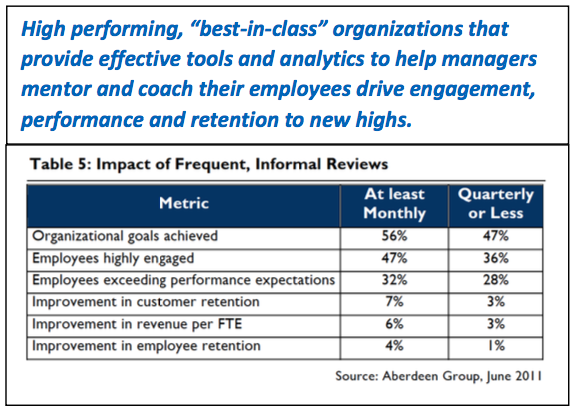 Integrated Talent Management is vital because it impacts engagement & retention. Based on extensive research, by increasing engagement and retention, organizations achieve significant bottom line results! Achieve the right job fit. 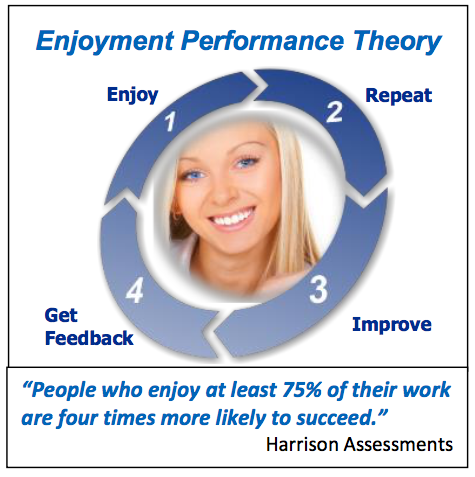 Harrison’s research demonstrates that people who enjoy at least 75% of their work, are 4 times more likely to succeed! Identify employees’ expectations. Meet expectations through a shared process involving employees and the organization’s leadership. 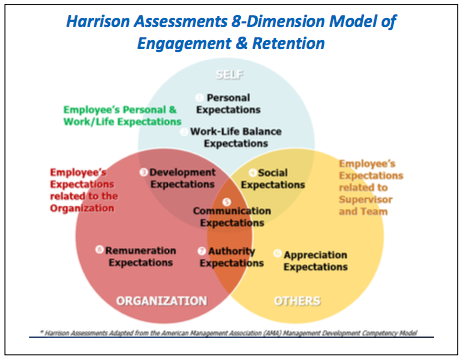 Harrison’s model measures 8 key dimensions including important employee expectations that impact the organization, teams and work/life balance. Measure employees’ motivations and attitudes. Achievement of expectations is not solely dependent on external factors like benefits, resources and enablers. 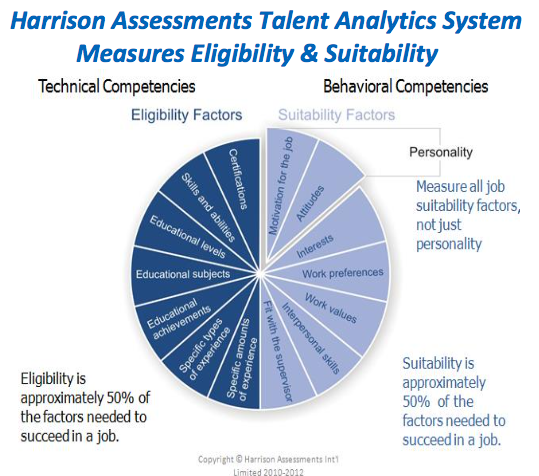 Harrison Assessments’ talent analytics system emphasizes the importance of internal motivators and attitudinal factors; by measuring these intrinsic factors, Harrison enables organizations to measure both expectations and motivations specifically for the employee and groups. In the following example the employee’s development expectations are Wants Development and Wants Advancement. 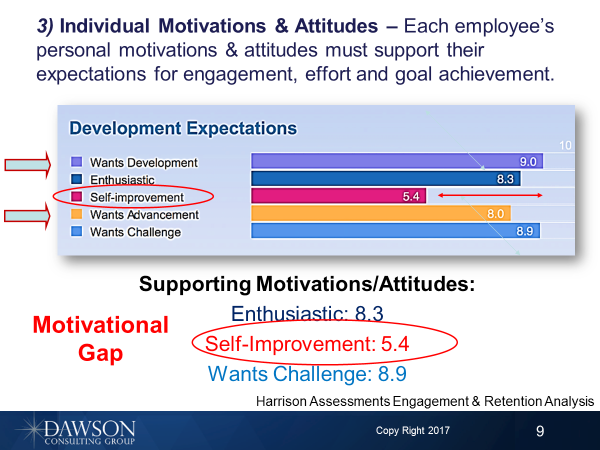 When gaps are identified, supervisors can effectively address them with the employee – here the employee has a potential performance gap in Self Improvement. With Harrison Assessments’ Engagement & Retention Analysis for groups, Learning & OD professionals are able to measure gaps for key populations to address consistent patterns of needs impacting success within the organization, such as millennials, high potentials or geographic and functional groups. For example, if a group of millennials rate the expectation Wants Development high, while a significant percentage have low to moderate scores in the motivator Enthusiastic, this reflects a Motivational Gap that must be addressed to ensure engagement and retention. The trait Enthusiastic relates to personal goals; moderate to low scores suggest employees may need to clarify their goals and discuss with their supervisors how they align with organizational goals. In addition, there may be a need for clarity of career paths and opportunities for development. Organizations must define developmental tasks, skills, competencies and knowledge, as well as available resources, mentors and trainers to facilitate development. Align mutual needs of employees and your organization. I have yet to find leaders who do not agree that talent relationships create performance success. Place the right employees in the right roles. That means not only measuring technical fit, but also the behavioral fit of new hires and internal candidates for promotion. In most cases, the suitability or behavioral side of fit is 50% of the equation! When you increase the ability to measure behavioral fit through effective assessment, you increase the predictability of success. 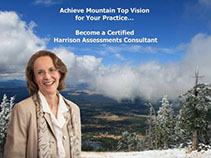 Harrison Assessments offers a highly accurate system to measure both sides of the equation. Set an expectation for engagement throughout the organization. When management understands their role in employee mentoring and coaching, and employees accept responsibility for their own motivational gaps, the sky is the limit on engagement! Set the expectation for excellence. While often overlooked this strategy raises the bar for everyone. It is a fact that if an expectation is not communicated, it is not likely to be achieved! 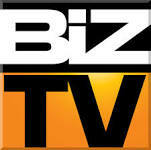 Integrate career development with succession planning. This strategy is an essential part of comprehensive integrated talent management processes. When organizations connect career development with succession planning, they are more likely to engage and retain talent and ultimately succeed in their business objectives. Yet, studies have shown that organizations of all sizes have acknowledged a lack of integration in these fundamental processes. Create a flexible and encouraging culture. According to the HfS Power to the People Global Study of Employee Engagement, when leadership seeks to control without providing employees with a sense of autonomy, engagement lags. Implement ongoing performance management through frequent and informal feedback. There is extensive research supporting this fundamental approach, yet leaders often fail to provide meaningful feedback to employees. 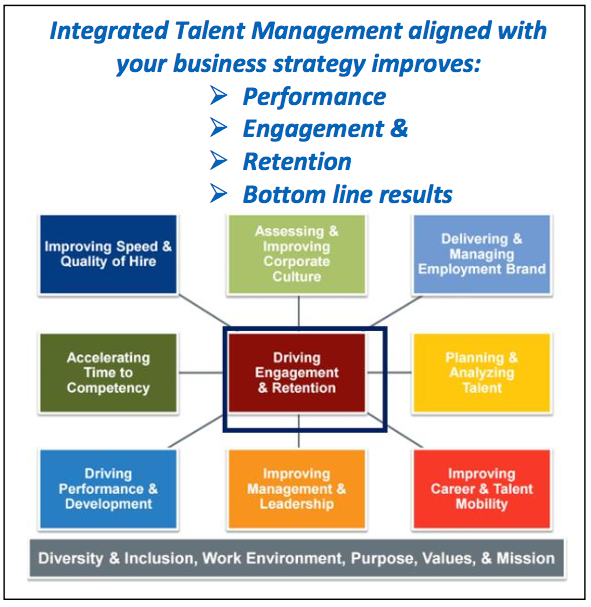 Integrate talent management aligned with business objectives. Strategy 9 reiterates our initial premise that the integration of talent processes drives engagement and reaps huge bottom line results. Invest in your leaders. Finally, strategy 10 of our Engagement Intelligence approach to talent emphasizes the fact that leaders are the top influencers of engagement and retention. According to a study by Gallup, “Poor leadership creates active disengagement costing the US an estimated $450 – 550 billion annually.” When you consider the bottom line impact of poor leadership, it is a compelling argument to start investing in your future leaders today! “Keeping your keepers” is vital to organizational success. These 10 Engagement Intelligence talent strategies are proven to impact organizational success; with a foundation of integrated talent management and effective engagement techniques, you can dramatically impact achievement of your strategic business objectives. Implement EQ10 in 2017 and advance your organization’s success!